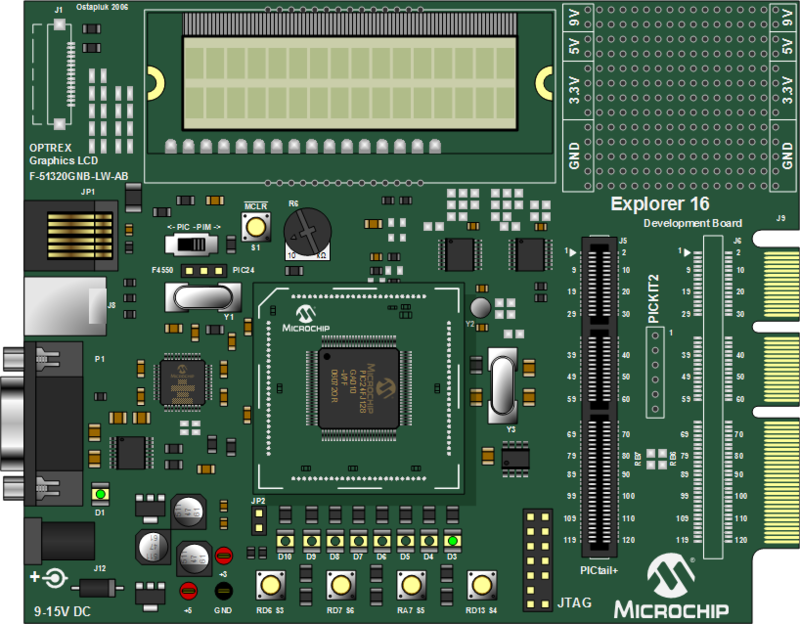 The Explorer 16 Development Board is a low-cost modular development system for Microchip's 16-bit and 32-bit microcontrollers. It supports devices from the PIC24F, dsPIC, and PIC32 families. A variety of families are supported with processor Plug-In Modules (PIMs) for easy device swapping. The board includes a PICtail™ Plus daughter card connector for expansion boards including USB, CAN, Ethernet, wireless, graphics and many more. This board comes with two interchangeable 100-pin PIMs supporting the PIC24FJ128GA010 and dsPIC33FJ256GP710 families or with two interchangeable 44-pin PIMs supporting the PIC24FJ64GA004 and dsPIC33FJ32GP204 families. All supporting documentation and software can be found at http://www.microchip.com/explorer16.